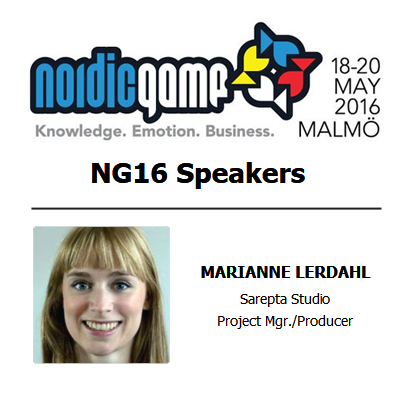 Marianne travelled to the Nordic Game Conference in Malmö last month to give a talk. The talk, “Avoiding the Tagalong Trap” was going to be based on the blog posts previously written by her and Catharina. In this article Marianne will share her experience and insight while working on turning a written piece into a 20 minute presentation. The organizers of the annual Nordic Game Conference announced their speakers for NG16 yesterday. Among the speakers are several of our good friends, like Jo-Remi Madsen and Ste Curran, but also our very own Marianne Lerdahl. She will be giving a talk based on our blog posts about “Avoiding the Tagalong trap”, – about how we worked when developing Shadow Puppeteer to ensure a strong co-op experience. The Nordic Game Conference is one of our favourite annual events, and we look forward to coming back. If you wish to reach out to Marianne while she’s attending the conference please send her a Tweet (@Vaffeldamen). Alternatively, to se up a meeting please contact emmy[at]snowcannongames.com. Hope to see you at NG16 May 18th – 20th, and we wish you welcome to attend Marianne’s talk. You can find the complete list of speakers on the Nordic Game website. Starting next week we take our annual ‘Christmas holidays’. It is a time when everybody on the team kick back, visit their families and celebrate Christmas and newyears. Previously we wrote about how to prepare for showing off your game at trade shows, giving you a timeline for when things need to be done and what to think about. This week we want to talk more about the specifics of, and differences between having a stand at a consumer- or industry oriented event. From this post we hope that you come away with new knowledge for when you travel to show off your amazing game. currently working on and hint at exciting developments regarding Shadow Puppeteer. Wii U is a trademark of Nintendo. © 2012 Nintendo.